As such when a Board gets big enough to justify them, it makes sense to create committees of the Board to deal with these specific responsibilities. A good question to start with is “when is a Board big enough to need committees?”. A three person Board should not have committees. The Board will be the default committee for all of this stuff. A five person Board could have committees and should have them if there is a lot of work required for audit and compensation. A seven person Board and larger should most certainly have committees. The audit committee provides oversight of the CFO function, the auditors, and related matters (which might include tax compliance, SEC compliance, etc, etc). The audit committee should be closely involved in the audit, should be briefed both before and after the audit by the auditors, and should do executive sessions with the auditors and without management. If issues come up during the audit that require Board attention, the audit committee and the audit committee chair are the right place to discuss them with the auditors. In the early days of a company it may not even be necessary to have an annual audit. And therefore the audit committee’s duties will be light. But over time as the Company grows, the audits become more complicated and the duties of the audit committee become more involved. When a Company is preparing for an IPO, it makes sense to spend time making sure it has a very experienced and involved audit committee and a “financial expert” as Chair of the audit committee. Most of the time, this financial expert will be a very experienced public company CFO or the partner of an audit firm, possibly retired in both cases so the proper amount of time can be committed to the role of Audit Committee Chair. I have worked with great public company audit committee chairmen and they are worth their weight in gold. A public company Board member will want to be sure the numbers are correct, the CFO is up to the task of managing the Company’s financials, and that the auditors are being properly utilized and managed. The audit committee chair provides this level of comfort to his or her fellow board members. This is a big job and it is important to have someone in the role who is prepared for it and committed to do it well. The compensation committee provides oversight of the Company’s compensation plans, including equity compensation, and also is directly involved in setting the compensation of the CEO and often the senior management team. The compensation committee has two related goals. First, they must insure that the Company’s compensation plans are appropriate to allow it to attract and retain the best talent in the market. And second, they must insure that the compensation plans are not too generous resulting in a loss of value from the shareholders to the management and employees. This is a delicate balance to strike. I like to make sure that the compensation committee has active peer CEOs on it who can speak to the current market value of talent and who will have a gut feel for what is reasonable and what is not. I also like to see compensation committees avail themselves of market data on compensation that can be supplied by a host of compensation consultants in the market. If a company errs on the side of being slightly generous in terms of compensation that is often a good thing. But things can get out of whack, particularly at the senior levels, as we’ve seen with compensation plans for large public companies that are not performing well but top managers are getting paid tens of millions in annual salaries. It is the compensation committee’s job to make sure this doesn’t happen. One of the compensation committee’s most important jobs is to help a company create, manage, and evolve its equity compensation plans. That can include restricted stock for founders and early employees at the start of a company, it can include an option plan, and it can include a restricted stock plan for public companies or restricted stock units for late stage private and public companies. This is complicated stuff. I did a whole MBA Mondays series on Equity Compensation and a good compensation committee can bring tremendous value to a Company by keeping it up to speed on best practices and the latest and greatest equity compensation approaches. 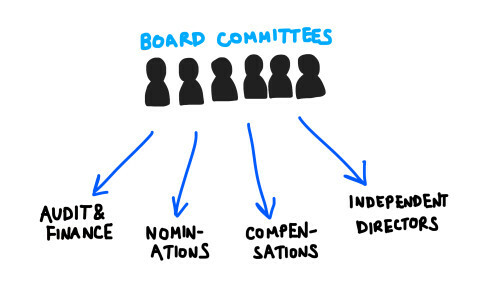 The third and final most common Board committee is the Governance Committee. This committee is reponsible for recruiting and nominating new directors, identifying directors who should leave the board and asking them to leave, setting the board meeting schedule, and a host of other “self governing” issues for a Board. All of this needs to be done in close coordination with the Board Chair and the CEO and so most governance committees are chaired by the Board Chair and have the CEO on them. I generally like three person Board committees, with one chair and two other members. This is most efficient for everyone. Committees can get bigger for large boards but I don’t see many Boards in the startup entrepreneurial world that are bigger than nine. And nine is large in my book. If you have a seven person board, you will have two people who serve on multiple committees. Ideally these people will not be the committee chair since the chair does the most work. If you have a five person board, I suggest going without the governance committee and making that the job of the entire board. Then you will have four non-CEO board members. One can be audit chair. One can be comp chair. And the other two serve on both committees. That’s a fair division of labor. If you have a nine person board, then you have plenty of people to serve on all the committees. Board committees should meet regularly. These meetings are often done before the main board meeting. But they can also be held in between board meetings. Board committees do not need to meet in person as much as the full board does and much committee work is done via conference calls. Strong, well led board committees that are engaged and active make for better Boards. A lot of the logisitcal work that Boards must do can be done in committee and simply reported to and ratified by the larger Board. This leaves time in Board meetings for the meaty strategic conversations where Boards can add the most value. So make sure you have set up committees when your company and your Board gets big enough to justify them. You will be doing yourself a favor and you will be doing your Board a favor too. Before you start thinking about committees, take a good look at the Board and make sure you have the right skills. A Board charter, an ethics policy, a whistleblower policy and that you have thought through what can go wrong. Plan for triumph but steel yourself for disaster. Disaster is many times the prelude to success. You just have to get through it. As to committees, organize them around whichever Board member has that skill and experience. No learning on the job. Put a CPA in charge of your audit committee not an MBA #s wizard. The rest of them are just crap. They are functionary as opposed to being structural. Before the first committee meeting, have committee charters drawn up. Hey, just go to the public filings of companies you admire and copy them. Modify them for your use. Don’t let a $/hr lawyer near any of them. Let the other companies pay the legal bills. Copy them. There are some great ones out ther. Make audit in charge of everything financial and yes, they are in charge of looking very carefully at the CFO’s work. Meet w/ the auditors without any members of management present. Then meet w/ the CFO present. Then meet w/out the CFO present. Trust me on this one. Develop a checklist of financial and audit responsibilities (GAAP treatment of leases by levelling, goodwill impairment, recognition of revenue policies, etc) by getting a very good PBC (provided by client) audit checklist and go down it scrupulously. If you can’t find a good one, I will send you one. Do the same thing w/ everything related to cash. Know how the cash is holding up at all times. GAAP but JLMAAP is better. JLM AAP is all about cash. This list will be your guide to things that go bump in the night. Have a long conversation w/ the CFO and the auditors on the basics — revenue recognition policies, reserves for doubtful accounts, GAAP v cash (e.g. recognition of payments on doubtful accounts) exceptions and other pertinent accounting issues. Write it down and adhere to it. If you do this, the emergencies will not be emergencies because you will have a policy in place for all of them. Nominations — what you want in a Board. If you do this at the outset, you will avoid some messy fights in the future. Don’t let a guy on the Board just because he is the deal guy from the VC firm. Get someone who is effective and can really help. Please get a guy who has gray hair, is a clever silver fox and has been to the rodeo a few times before. Get a guy who knows how to bring a boat into a tight dock in high winds. A guy with some patience and confidence. Don’t get a guy on his 4th trophy wife who is screaming out for recognition. Yoda not Darth Vader. Compensation committee — get good advice on compensation (salary, benefits, short term incentive comp, long term incentive comp, something special) and design a system with specific targets. When your guy hits the targets really reward him with an eye toward the value created. Pay the guy and put the golden handcuffs on him before he even thinks about wandering. Averages are the best of the worst and the worst of the best — commit to paying 125% of market. And then do it. What is it worth to have a completely committed CEO? Priceless! Put the damn deal in writing and sign it and review it every year. Document your reasoning. No room for misunderstanding. 1. Make the head of the comp committee the guy who is closest to the CEO and who can have a conversation without starting a war. 2. Perform performance appraisals — good and bad. Do them regularly (every 6 months) and use a good exemplar. Hit all the topics. 3. Tell the guy if he is doing OK and not risking getting canned and tell him when there is a real chance to get canned. Be honest and be candid. Many times CEOs have a blind spot. Independent Directors committee — very important and must religiously meet and discuss things. Think of this as a rehearsal if you go to the paywindow or if you crash and burn. Every minute spent together in the relaxed environment of the ID committee will be worth an hour when the feces hits the fan. Keep minutes for all committee meetings — not War & Peace — but a trail of bread crumbs which tells you you are not circling around back onto your own trail. Chart the progress. You will be surprised at how much you accomplish. Work your deal and take accountability for the outcomes. You know when you are hitting the sweet spot. This article was originally written by Fred Wilson on April 9, 2012 here.